The theological debate about the imago Dei (the Latin term meaning “Image of God”) that has existed for centuries, has not only caused confusion to this simple term, but has also produced many distorted doctrinal positions. The phrase “image of God” has been defined in various ways throughout history, ranging from relational, moral, self-consciousness, volition (i.e. free will), intellect, or the capability for spiritual or religious praxis. Many of these definitions are simply imputed from their definition of the soul. We should note, contrary to popular belief, that the Bible does teach animals have a soul. An example of this is Dave Hunt who seems to express the soul is what distinguishes man from animals. He writes, “If all we are is the material of our bodies, then evolution might have some validity. But if there is a nonphysical part of man that animals don’t have (for which there is abundant proof), then evolution of the physical body could never explain the development of humans. Furthermore, that difference would constitute an impassible chasm preventing any evolutionary ancestral relationship between animals and man.”1)Dave Hunt, Seeking and Finding God, The Berean Call (Bend, OR: 2004, 2005), p. 8-9 This explanation presented by Dave Hunt as a rebuttal of evolution is weak in that it leaves open the possibility of animals evolving (since they are only physical beings with an impassible chasm between man) but man is somehow different because an immaterial essence exists which could not have evolved through materialistic methods. Dave Hunt was a young earth creationist. He merely missed the implications of the argument presented. The Hebrew phrase nephesh hayah חַיָּה נֶפֶשׁ is translated as “living soul” in Genesis 2:7 as describing man. The same phrase is used to describe animals throughout the creation account of Genesis 1: “creature that hath life” (Genesis 1:20); “every living creature” (Genesis 1:21); “living creature” (Genesis 1:24); and again the phrase is attributed to “the fish of the sea, and over the fowl of the air, and over every living thing that moveth upon the earth” (Genesis 1:28). In verse 28 the phrase “living thing” is the same as “living soul” in Genesis 2:7 as referring to Adam. Solomon states in Ecclesiastes 3:19-21 that if man and animals were mere physical beings, there is no difference in value between them since both will die. He then implies that from the knowledge that can be attain “under the sun” (the continuing theme of the book) we cannot know whether the spirit of man and animals go to different places so without knowledge of the topic apart from God given revelation, we are no better than animals. The point he is making is that whether man and animals are only physical, man is no better, and if we both have a immaterial or spiritual aspect, we still cannot discern ourselves any better than animals unless the distinction is something more than a mere spirit, or soul within us. He concludes in chapter 12 that the spirit of man “shall return to God who gave it” (Ecclesiastes 12:7). Obviously, there is something that values man in the sight of God according to Solomon. Solomon does not imply his advanced knowledge made him better then animals (Ecclesiastes 2:12-14) but concludes the intellect is vanity (Ecclesiastes 2:15-16; 12:12). Early Christians rejected the idea of intellect being the definition of the image of God. Tatian wrote in the second century, Man is not, as the croaking philosophers say, merely a rational animal, capable of understanding and knowledge; for, according to them, even irrational creatures appear possessed of understanding and knowledge. But man alone is the image and likeness of God…”2)Tatian, Address of Tatian to the Greeks chap. XV; The Ante-Nicene Fathers, ed. Alexander Roberts and James Donaldson; 1885-1887, Hendrickson (Peabody, Massachusetts) 1994, fifth edition 2012, Vol. 2, p. 71 Back to Ecclesiastes, Solomon seeks all his fleshly desires withholding nothing from himself (Ecclesiastes 2:10); and we see from the historical narratives his acting like an animal from his lust for women (1 Kings 11:-8). Morals therefore cannot pertain to the definition of the image of God in man. The image of Caesar on the coin did not mean that coin represented Caesar, but rather that Caesar’s mark on the coin was the reason it carried the ability to have universal value within the Roman empire’s commerce. Thus the necessity of money changers existed to exchange the coin to what was viewed as valued elsewhere. Man bearing God’s image is identifying our value within His universe which is why to attack a fellow man is a capital offense as an attack on the One Who gives the valued essence (Genesis 9:6). However, animals do not have this value in God’s sight, and can be killed for man’s use (Genesis 3:21; 8:20; 9:3). As the words “image and likeness” are conjoined together, most commentators have assumed that it is to be understood as synonyms. However, Genesis 1 is within the literary genre of a historical narrative so it is unlikely that this is expressing synonymous parallelism. Consider the use of words throughout the creation account of the other living creatures: “fowl that may fly” (v. 20); “great whales” (v. 21); “cattle, and creeping thing, and beast of the earth” (v. 24). Though some of these terms are all-encompassing generalizations, they are distinct from each other and do not represent synonymous parallelisms (though different adjectives may be contributed such as in the case of “winged fowl” (v. 21) which is the same as “fowl that may fly”. One phrase says they have wings, the other expressing the purpose of God’s design of the wing). The conjoining of “likeness” to “image” is to be understood as to identify man is only “like” God though in bearing His image but still vastly separated in inferiority. Other passages using this terminology express man’s descendants are like their father but not exactly the same as their father (Genesis 5:3); or carved and molded idols are similar to the animals they are representing but obviously very inferior as the idols do not move, make noises, or actually live as do the animals they are formed after (Exodus 20:4; Deuteronomy 4:16, 23, 25, 5:8). Jesus Christ, who is God the Son, is said to be “the brightness of his glory, and the express image of his person” (Hebrew 1:3)—not a mere likeness of God but the express image of God. If the verse had said the man was the “image of God” without “likeness,” it would imply men are gods as ancient paganism teaches. The use of the term for pagan kings gave them authority and dominion over the subjects in their kingdom, but note also that as Amenophis III was said to have “came forth from my members, my image, whom I have put on earth” it attributes divinity to mere man which is why it is necessary for Scripture to distinguish “image and likeness” to not allow such deification of man. That is consistent with historical view of Christian authors such as Irenaeus writing around 170 AD, stated, “Now the soul and the spirit are certainly a part of the man, but certainly not the man; for the perfect man consists in the commingling and the union of the soul receiving the spirit of the Father, and the admixture of that fleshly nature which was moulded after the image of God…. Thus also, if any one take away the image and set aside the handiwork, he cannot then understand this as being a man, but as either some part of a man, as I have already said, or as something else than a man.”16)Irenaeus, Against Heresies, Book V, Chap. VI, para. 1; The Ante-Nicene Fathers, ed. Alexander Roberts and James Donaldson; 1885-1887, Hendrickson (Peabody, Massachusetts) 1994, fifth edition 2012, Vol. 1, p. 532 It is suggested by also recognizing that Genesis 1 expresses God as the transcendent Creator Who is eternal in preceding the creation of the time dimension, man bearing God’s image also offers evidence that God’s purpose for man was to exist physically with everlasting life. Thus this expression is an underlining doctrine for the bodily resurrection of both those who are born again as well as those who will be cast in to the lake of fire (John 5:29; Revelation 20:5-6, 11-15). This is not fully agreeable with the text as it only states that God’s purpose for creating man in His image is for man to have dominion over creation. He is correct when writing, “Many theologians are too restrictive in their view of God’s image. A more comprehensive view incorporates all the biblical data related to man as the image of God.”18)Robert Gonzales, Jr., “Man: God’s Visible Replica and Vice-Regent,” Reformed Baptist Theological Review, 05:2 (Jul 2008), p. 68 Though the biblical data gives us only the functional view of man having dominion, the other elaborate views such as relational, intellectual, spiritual and moral; do not define what the image of God is but rather the capabilities God instilled into man to enable him for His purpose of creating him with God’s image—that is God enabled man with these attributes to accomplish subduing creation in a responsible fashion. For example, the moral attribute stems from our spiritual capacity to intellectually understand God’s law written in our hearts (Romans 2:14-15) and responsibly apply it to our dominion of creation. Robert Gonzales offers a great explanation of how the relational aspect applies as well. It is worth mentioning the plural of majesty only occurs in nouns, not in pronouns or verbs; so the verse mentioned is emphatically expressing the triune nature of God. The attributes instilled into man to enable him to fulfill God’s purpose of subduing the earth is summed up by Henry Morris. “In order to subdue the earth, we must first understand its processes. Thus, research is the foundational occupation for fulfilling the divine mandate. Then this knowledge must be applied in technology (engineering, medicine, agriculture, etc.). It must be implemented for use by all (business, commerce) and transmitted to future generations (education).”22)Henry Morris, Dominion Mandate, http://www.icr.org/article/dominion-mandate/ This command consists of subduing the earth and having dominion over the animals which Adam initiated when naming the animals at God’s command (Gen. 2:18-20). Carl Linnaeus (1707-1778) was the founder of modern classifications for animals, wanted to classify the created kinds, taking inspiration from Adam. When we consider some of the unique aspects of these animals which God had created with such complex design, we can begin to take serious the responsibility of subduing and having dominion as God’s purpose for us. Let us first consider the Woodpecker. Its unique feet have two toes to the front and two toes toward the back, and they are unlike other birds that have three toes to the front and one in the back. This foot enables the woodpecker to climb trees vertically, right side up, upside down, or sideways; in conjunction with its tail feathers that are stiff, unlike other birds, which allows it to take a stance like a tripod and brace itself for the force used when it pecks away at a tree. “When a woodpecker slams its head into a tree, the deceleration experienced is many times gravity. The nerve and muscle coordination must produce a dead-on hit; a slip to one side or the other could virtually wrench the cover off the brain! The eyelids snap shut when the beak strikes its target. Some scientists say that’s to keep wood chips out of the eyes; others say it’s to keep the eyeballs from popping out if their sockets! Both may be right!”23)Gary Parker, Creation: Facts of Life, Master Books (Green Forest, AR: 1980, 2006), p. 65 In order to handle this force of pecking at the hardest of wood of a tree, it has an extremely hard beak, a heavy duty skull, and a shock absorber between the two. Without these three parts in their proper place the beak, or skull would be crush, the bird would die, and any iota of evolutionary processes is impossible. After pecking holes into a tree, the woodpecker needs to retrieve bugs from within. Its tongues is an amazing thing. It is long and slender, but the anatomy of this compact bird has little space to fit such a tongue. 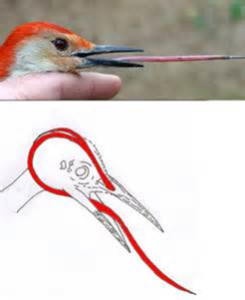 “The answer for the woodpecker is to slip its tongue attachment into a muscular sheath that wraps around the skull underneath the scalp and insert into the nostril!”24)Gary Parker, Creation: Facts of Life, Master Books (Green Forest, AR: 1980, 2006), p. 65 The tongue “is used to probe these tunnels for insects. The tip is like a spearhead with a number of barbs or hairs pointing rearward. This facilitates securing the insect while transporting it to the beak. A stickyglue-like substance coats the tongue to aid in this process as well. When he brings the bug into his mouth, there is a little factory that produces solvent to dissolve the glue so that he doesn’t swallow the bug with his tongue.”25)From Martin Job, in Incredible Creatures that Defy Evolution (DVD, disc: 1); http://creationcrusade.weebly.com/incredible-ceatures-that-defy-evolution.html?vm=r&s=1 This is known as irreducible complexity. If one of these unique features of the woodpecker were not in its proper work order at the beginning it could not survive. There is no possibility of a step by step gradual evolutionary process over millions of years. Obviously, God cares for the birds He has designed so perfectly, how much more does He love man made as the crown of His creation (Luke 12:6-7)? 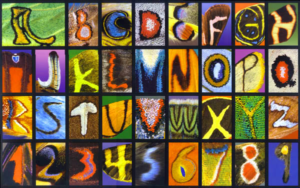 The phenomenon known as “The Butterfly Alphabet” is an interesting factor of design, though the discoverer, Kjell Sandved, unwisely attributed this “design” to “Nature” and evolution. Kjell Sandved speaks of a time when he discovered butterfly wings with images that were used to scare away potential predators. These designs’ visibility can also be a delight in the eyes of their enemies: birds of the rainforest whose favorite food is butterflies, moths, spiders, flies, larva and other insects. Mother Nature gives all living forms means for survival, including the tendency of insects and animals to “cheat” in order to avoid being eaten or running the risk of extinction. 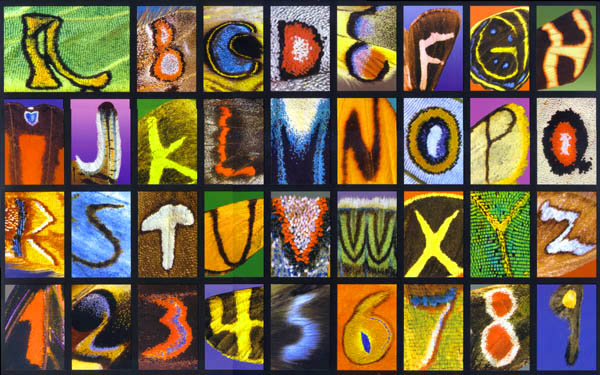 Kjell started finding realistically “painted” images on the top of, or on the side of, or on the underside of various butterflies, moths, spiders and flies. If “Mother Nature” produced these survival traits of “design” being described as “painted images” we would ask what was Mother Nature’s purpose for “designing” an alphabet on the wings of butterflies? What survival advantage comes from the mimicking of human languages? The giraffe is another one of God’s amazing creatures. It large, long neck makes a need for a large powerful heart to pump blood against gravity toward the brain. The strong pump causes a further need for elastic arteries along with pressure sensors along these arteries. When the giraffe bends his head down to drink, the force of the blood pumping towards its brain becomes deadly. The giraffe has got a problem when he bends his head down to get a drink of water. With all that blood the heart squeezes, well, the blood goes zoom and blows his brains out through his ears. He is now dead. And, so, he must be thinking, “I’ve got a problem. When I get a drink of water I blow my brains out. Okay, I better evolve something here to fix this.” Well, of course, dead animals don’t evolve. But anyway, it doesn’t blow his brains out. Why? Because, as the blood comes down there is like little spigot — little valves — in the artery that goes up the neck which close. When the giraffe’s head is down, there is also a sponge under the brain and it gently expands to protect the brain so it doesn’t blow out. Now, the giraffe is getting his drink of water and he sees a lion coming up. “I’ve got to get out of here, he is going to eat me.” The giraffe jumps up, runs about three steps, and passes out — not enough oxygen to the brain. The lion eats him. He says, “I have another problem. I pass out when I get up too fast and so the lion eats me.” Well, dead animals don’t evolve. They can’t fix it. But, the giraffe doesn’t pass out, because as he raises his head up our Creator the Lord Jesus has made it so those valves open up and the sponge under the brain gently squeezes that last pump of oxygenated blood up into his brain and he is doing just fine. Only God could create that. This “sponge” is called the Rete merabile, it is an expanding and contracting sponge-like web of blood vessels between arteries and brain. Gary Parker said, “Because their neck is so long, there’s a huge distance between a giraffe’s heart and its brain. It needs auxiliary pumps to get the blood to the brain so it won’t faint when it raises its head up—and it need pressure reducers so that when it bends its head down to take a drink, it won’t blow its brains out! A long neck without these features would be deadly.”28)Gary Parker, Creation: Facts of Life, Master Books (Green Forest, AR: 1980, 2006), p. 105 Furthermore, the giraffe has tight skin on its legs to keep vessels from bursting and a thick inner layer of fascia to prevent blood from pooling and excessive bleeding. Even atheistic evolutionists have unwittingly proven the Word of God as recorded in first chapter of Genesis when they unconsciously participate in God’s dominion mandate. Previous articleIs Distant Star Light Evidence for Millions of Years? Next articleHow is an Ancient Toilet Evidence for the Bible?